I have been very impressed with the results I’ve seen in my Back to Eden vegetable garden, so naturally I looked for new ways to implement this permaculture technique. In the past, I’ve discussed my love for container gardening here. Even though my vegetable garden has grown exponentially, I still utilize containers throughout our property. I decided to try something wacky and use the principles of Back to Eden in my containers. Wowzers! The result were just as impressive as they were in the garden. So I just toss in some mulch? Although people dwell on the wood chip aspect of Back to Eden gardening, there is much more involved. I’ve got through the concept of Back to Eden in another post, so I won’t prattle on again about it. Basically, we want to recreate nature, but this time in a container. When we recreate nature, nature does the majority of the work for us. Thank you permaculture! An important detail when setting up your container(s) is you want to make sure there is adequate drainage. This is important in any outdoor gardening container, but even more so when you are using a system that maintains moisture as well as Back to Eden does. To improve drainage, you may want to consider adding crushed rock or gravel to the bottom of your container. When it comes to the soil you choose, real soil from a garden or anywhere on your property beats store bought hands down. The reason for this is that you want all those great worms that exist in nature. If you are stuck purchasing soil from a garden center, you will want to go to a local bait shop and purchase live bait worms. Worms are a very important in Back to Eden gardening and they will improve your container gardening experience. Check with your local tree service to see if they offer free wood chips. You want variation in sizes and types of wood. After you’ve got your drainage holes, garden soil, and worms, you are ready to apply your wood chips. Apply 2-3 inches of wood chips to the top of your container. Remember, real wood chips are superior to garden center mulch. You want a variation in sizes and types of wood. I get my wood chips from our local tree service, Hutch’s Tree. Make sure not to mix the wood chip into the soil as this might cause a loss of nitrogen from the soil as the wood chips break down. You may want to get your plants in place before adding the chips so you don’t risk them mixing in. Back to Eden containers require very little maintenance. Unless you are going through a serious dry spell, nature will take care of the watering. 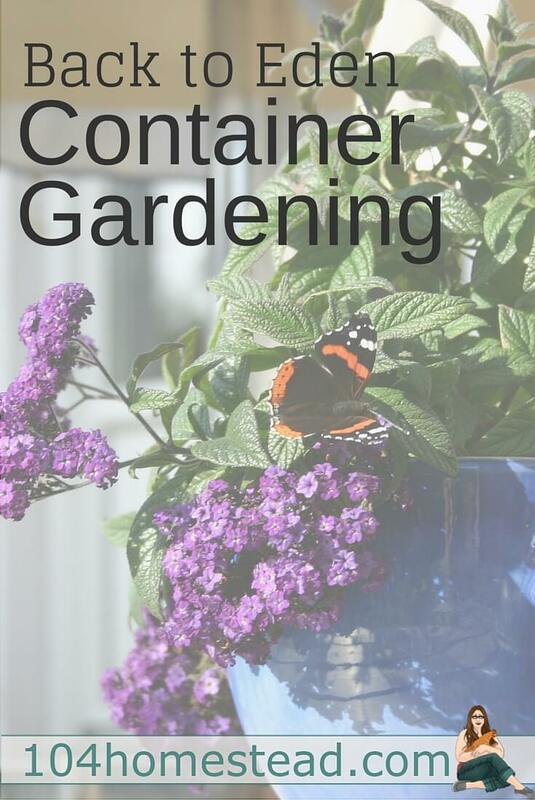 You’ll want to top dress your container from time to time with a great nutrient rich compost. Tip: When you dead head or prune your plants, leave the cuttings in the container. They will add nutrients to the soil and feed the worms. I promise, if you try Back to Eden container gardening, you’ll be very pleased with the results. As always, feel free to share your garden photos and updates on our Facebook Page. I have just been learning about BTE gardening as I am preparing to move from my apartment to my land. And I had wondered if it would work in my containers on my balcony. I am SO glad you have shared this information. Thank you. I just yesterday learned about “Back to Eden” style of gardening and I grew up on a farm. Well, my brothers and dad tilled the ground but they added many of the same materials that Eden suggests, such as garden waste and animal waste. My dad called it “feeding the garden”. I now live in an apartment so will prepare some pots soon to try my Eden approach. 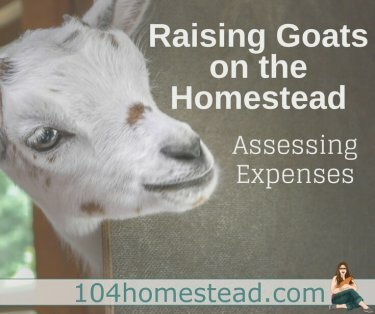 What have you had the most success growing using this method? So you mention top dressing with compost from time to time. As I understand it, it is a layer of gravel at the bottom, soil, then top dress with the wood chips. After you add the compost, say, every six months, do you ever repeat the process? As in, more wood chips over the top dressing of compost in the container? Thanks! As it rains and you water your containers, the compost will trickle into the wood chips and add nutrients to the soil. You just want to sprinkle the compost when you are top dressing. After some time, you may notice your wood chips have broken down significantly. Once they have broken down, you’ll want to add a fresh new layer of wood.